19th-century painting on display at Versailles depicting Adhemar of Le Puy (in red to left of Raymond IV, Count of Toulouse). Born around 1045 into the family of the Counts of Valentinois and elected Bishop of Le Puy around 1080, he was an advocate of the Gregorian Reform, and among his supporters were the future Pope Urban II and Raymond of Saint-Gilles, Count of Toulouse and the richest, most powerful nobleman in France. He was also said to have gone on pilgrimage to Jerusalem around 1086. He was the brother of William Hugh of Monteil, who was also a Crusader during the First Crusade. Adhemar most likely met Pope Urban II, when in August 1095 Pope Urban the Second visited Puy. 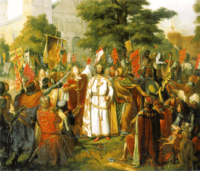 At the Council of Clermont in 1095, Adhemar showed great zeal for the crusade (there is evidence that Urban II had conferred with Adhemar before the council). Adhemar was named apostolic legate and appointed to lead the crusade by Pope Urban II on 27 November 1095. In part, Adhemar was selected to lead because he had already undertaken a pilgrimage to Jerusalem in 1086 and 1087. Following the announcement of the Crusade Adhemar spent the next year raising money and recruiting men. Departing on 15 August 1096, he accompanied Raymond IV, Count of Toulouse, in his army to the east. Whilst Raymond and the other leaders often quarrelled with each other over the leadership of the crusade, Adhemar was always recognized as the spiritual leader of the crusade and was widely respected by the majority of the Crusaders. During the leg of the trip from Durazzo to Constantinople, in the Valley of Pelagonia, Adhemar was set upon by a group of Pecheneg Mercenaries, one day when he had wandered too far from the majority of the Crusader forces. The Pechenegs beat and robbed Adhemar. However, one of Adhemar's assailants wished to keep his belongings for himself and ended up in quarrel with the other assailants. It was at this time Adhemar was saved by Crusader forces who had noticed the disturbance. Once the army had reached Thessalonica, Adhemar decided to stay there for some time, due to sickness, whilst the Crusader forces moved onward. Following this delay Adhemar, eventually was able to regroup with the Crusaders. Adhemar negotiated with Alexius I Comnenus at Constantinople, reestablished some discipline among the crusaders at Nicaea, fought a crucial role at the Battle of Dorylaeum and was largely responsible for sustaining morale during the siege of Antioch through various religious rites including fasting and special observances of holy days. One such time he did this, was after an earthquake during the siege of Antioch, he had the Crusaders fast for three days and had the priests and clergy perform mass and prayers. 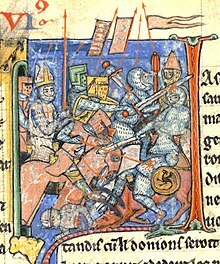 Adhemar during the Siege of Antioch, also had ordered the Crusaders to shave and wear a cross in an attempt to stop Crusaders from attacking one another by accident. After the capture of the city in June 1098 and the subsequent siege led by Kerbogha, Adhemar organized a procession through the streets and had the gates locked so that the Crusaders, many of whom had begun to panic, would be unable to leave the city. He was extremely skeptical of Peter Bartholomew's discovery in Antioch of the Holy Lance, especially because he knew such a relic already existed in Constantinople; however, he was willing to let the Crusader army believe it was real if it raised their morale. Adhemar was protected by a band of Crusaders led by Henry of Esch to preserve the (albeit suspect) relic. In June 1098 Adhemar fell prey to sickness and in the following months his condition would continue to deteriorate. When Kerbogha was defeated, Adhemar organized a council in an attempt to settle the leadership disputes, but he died on 1 August 1098, probably of typhus. Following his death, Adhemar was buried in Antioch within the Basilica of St Peter. The disputes among the higher nobles went unsolved and the march to Jerusalem was delayed for months. However, the lower-class soldiers continued to think of Adhemar as a leader. Following his death, Adhemar reportedly appeared in several visions seen by various different Crusaders. One of the first visions was reported by Peter Bartholomew who stated that Adhemar appeared to him stating the due to his skeptism of the Holy Lance he had spent a few days in hell and was only rescued because a candle had been burned in his memory, he had given a gift to the Shrine where the Holy Lance was kept, and due to the prayers of Bohemond. At the siege of Jerusalem Peter Desiderius claimed that to have received a vision from Adhemar, himself. It was in this vision, that Peter claimed Adhemar had instructed him to have the Crusaders fast and lead a procession around the Walls of Jerusalem. This was done and Jerusalem was taken by the Crusaders in 1099. Later on, Stephen of Valence also claimed to have had visions featuring Adhemar in which Adhemar spoke to Stephen of several relics. Adhemar told Stepehen great reverence should be given to the cross Adhemar had taken with him on the crusade. He also told Stephen how the holy lance should be treated and told Stephen to give Stephen's ring to Count Raymond. He told Stepehen through this ring Count Raymond would be able to call upon the power of Mary. ^ a b c d 1964-, Kostick, Conor, (2008). The social structure of the first Crusade. Leiden: Brill. ISBN 9789047445029. OCLC 607092233. ^ a b c d e f g Brundage, James A. (1959). "Adhemar of Puy: The Bishop and His Critics". Speculum. 34 (2): 201–212. doi:10.2307/2853164. JSTOR 2853164. ^ a b c Peters 1971, p. 31. This article incorporates text from a publication now in the public domain: Chisholm, Hugh, ed. (1911). "Adhemar de Monteil" . Encyclopædia Britannica. 1 (11th ed.). Cambridge University Press. p. 192. Kostick, Conor. The Social Structure of the First Crusade. Brill, 2008. JSTOR, www.jstor.org/stable/10.1163/j.ctt1w8h1gw. Brundage, James A. “Adhemar of Puy: The Bishop and His Critics.” Speculum, vol. 34, no. 2, 1959, pp. 201–212. JSTOR, JSTOR, www.jstor.org/stable/2853164. Derbes, Anne. “A Crusading Fresco Cycle at the Cathedral of Le Puy.” The Art Bulletin, vol. 73, no. 4, 1991, pp. 561–576. JSTOR, JSTOR, www.jstor.org/stable/3045830. This page was last edited on 6 October 2018, at 16:51 (UTC).